Any guesses as to the number one word to describe float building? Before I got here, I thought of these…exciting, beautiful, fun…and all of them are accurate, but the number ONE word would be Tedious. Every little thing that must be done, must be done a million times. one at a time over a large surface. It takes about six full carnations to petal a single rose petal on the float. There are twenty roses with six petals each, two sides to each petal (not counting the center), so that makes 20 x 6 x 2 x 6 = 1440 whole carnations dismantled in to individual petals. Wow, it’s going to be a long rest of the week. In the couple hours that I was up on the scaffolding, I only managed to petal two inside rose petals. In the big scheme of things, the flowers are pretty incredible that are coming out of the flower tent. 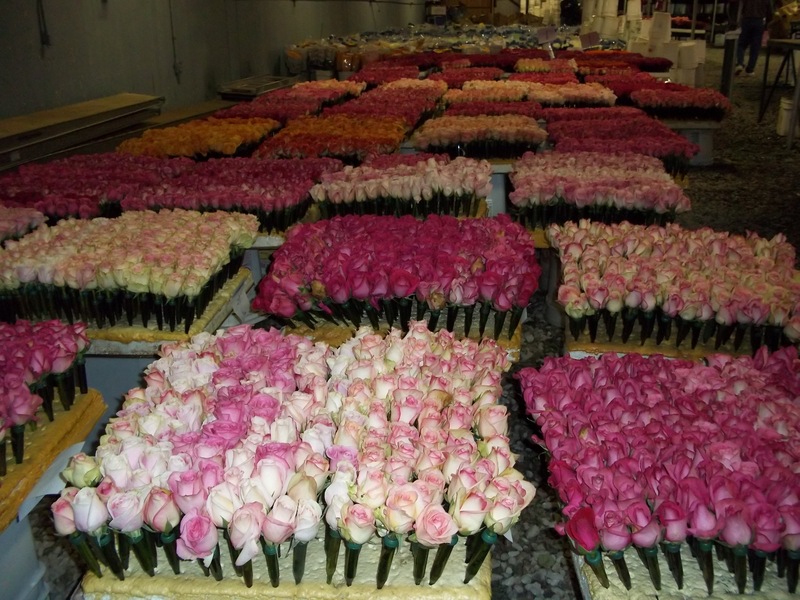 Yesterday, they vialed 41,000 individual flowers – a single day record for most flowers put in water vials in one day. All of the main flowers are put in water vials that have a pointy end so they can be poked in to Styrofoam on the float. The flower tent is located at the end of the Rose Palace in a separate tent, it is where all the fresh flowers are stored until needed for the floats. When it is time to procure your flowers, the crew chief takes her “book” into the tent and confirms with the curator what she is taking. Today we pulled out three buckets of carnations – white, pink and hot pink – each of 250 flowers. We will go back tomorrow for more. 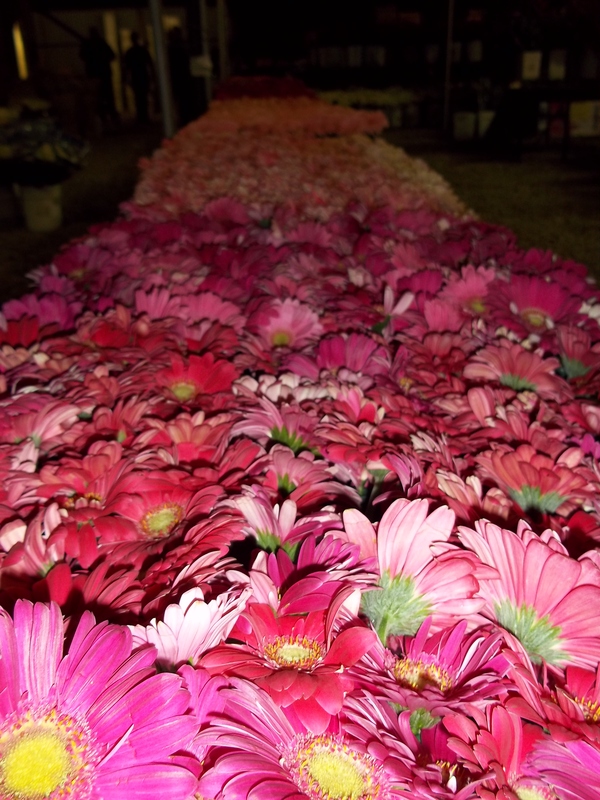 There are all kinds of flowers in the tent, from Gerbera Daisies to Birds of Paradise. There are carnations and roses and mums, all colors imaginable, and if that’s not enough, there are Seed containers too. Four separate con-ex boxes that hold all of the various seeds and dried material that may be needed. I got to go procure dried parsley flakes today. Other seeds that are being used on our float include coffee, curry, cumin, onion, poppy seed – these are all being used to create a portrait of Christ. As I sat above the portrait working on the roses today, the smell was described as “hipster” – you know, coffee and curry together. Dried flowers make up the rest of the float, from Everlasting to straw flowers. Seeds are how anything dry is referred to, Flowers is the technical term for anything wet. It’s a pretty simple method to keep track of the world according to float making. I am still enjoying the people the most, thank you everyone for making this a great experience, I’m looking forward to another great day tomorrow.